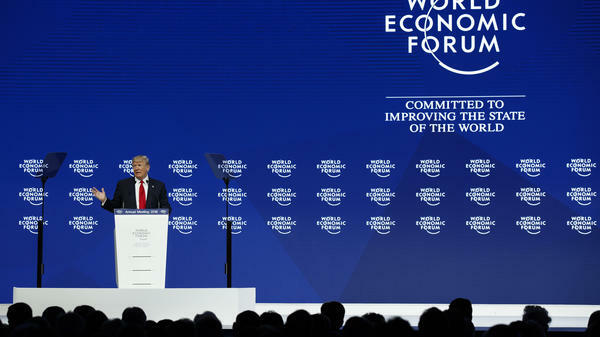 President Donald Trump speaks at the World Economic Forum on Friday. In a 15-minute speech to the economic and political elites gathered at a ski resort in the Swiss Alps, Trump touted gains in the stock market and job growth during the first year of his presidency. "Small business optimism is at an all-time high," Trump said. He told business leaders, "There has never been a better time to hire, to build, to invest and to grow in the United States." Trump said his administration has undertaken the most extensive regulatory reduction "ever conceived." 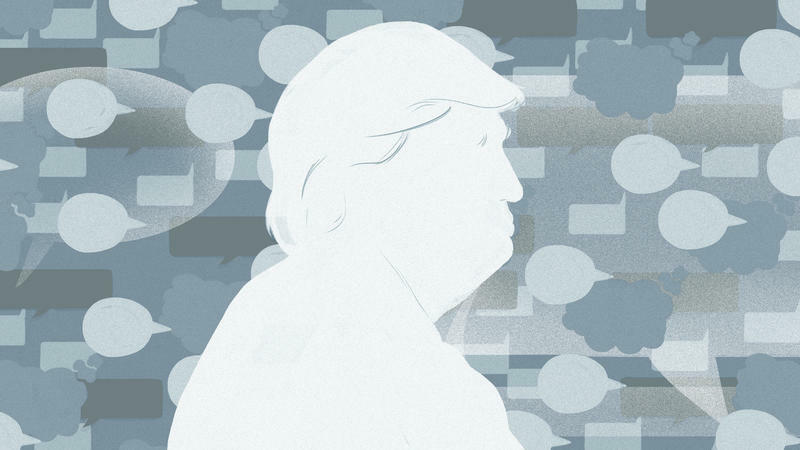 Particularly in the beginning of Trump's term, Congress used an obscure law to roll back Obama-era regulations, many related to business and the environment. Trump said he was working to overhaul the international trading system, warning the U.S. supports free trade, "but it needs to be fair and it needs to be reciprocal." He said the U.S. will "no longer turn a blind eye to unfair economic practices including massive intellectual property theft, industrial subsidies, and pervasive state-led economic planning." 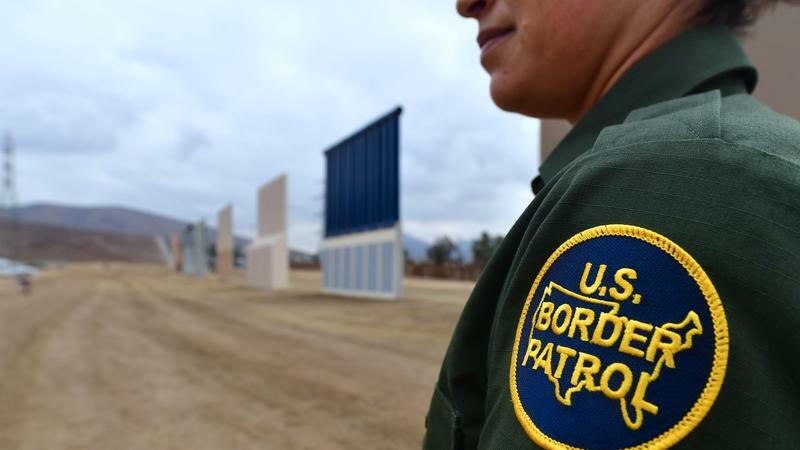 Trump also addressed immigration, on the heels of the release of his administration's proposal, which calls for a path to citizenship for up to 1.8 million immigrants in the U.S. illegally as well as new restrictions on legal immigration. "Our immigration system is stuck in the past," Trump said. He said the current system of extended-family migration must be replaced with a "merit-based" system of admissions that selects new arrivals "based on their ability to contribute to our economy, to support themselves financially and to strengthen our country." Aides said ahead of the president's speech that it would be a kind of pitch for the United States, where Trump is working to foster a new business climate of low taxes and limited regulations. "President Trump's economic agenda has unleashed the U.S. economy, and we are growing," National Economic Council Director Gary Cohn told reporters this week in a preview of the speech. "His policies have led to a rising stock market, low unemployment and strong GDP growth. The administration's commitment to deregulation, and our passing of comprehensive tax reform, have helped level the playing field for our businesses and our workers." Trump is the first sitting U.S. president to attend the Davos summit since Bill Clinton went in 2000. The glitzy annual gathering at a Swiss ski resort attracts wealthy businesspeople from around the world. Trump wants more of them to put their money to work in the United States. "We want the world to invest in America and to create jobs for hardworking Americans," Cohn said. Earlier this week, the administration ordered stiff new tariffs on imported washing machines and solar panels — and the president warned of more protectionist actions to come. "If you treat us one way, we will treat you the same way," Cohn said. "If you have no tariffs, we will have no tariffs. If you have tariffs, we should have a reciprocal tariff. It's hard to argue against that." In one of his first actions as president, Trump withdrew the U.S. from a 12-nation Asia Pacific trade pact negotiated under the Obama administration. The other 11 countries continued to move forward with the deal. Canadian Prime Minister Justin Trudeau used his appearance at Davos this week to announce the remaining countries had reached an agreement — without the United States. Friday Trump left open the idea of further negotiation with those countries, though, noting existing relationships with a number of them. "We would consider negotiating with the rest individually or perhaps as a group if it is in the interests of all," he said. On CNBC Thursday, Trump said, "I would do TPP if we were able to make a substantially better deal." In a question-and-answer session at the end of the speech with World Economic Forum founder Klaus Schwab, Trump returned to a familiar riff: his treatment by the news media. He said as a businessman he "was always treated really well by the press." He added, "It wasn't until I became a politician that I realized how nasty, how mean, how vicious and how fake the press can be." His comments prompted some audible boos from the audience, according to a pool reporter at the event. 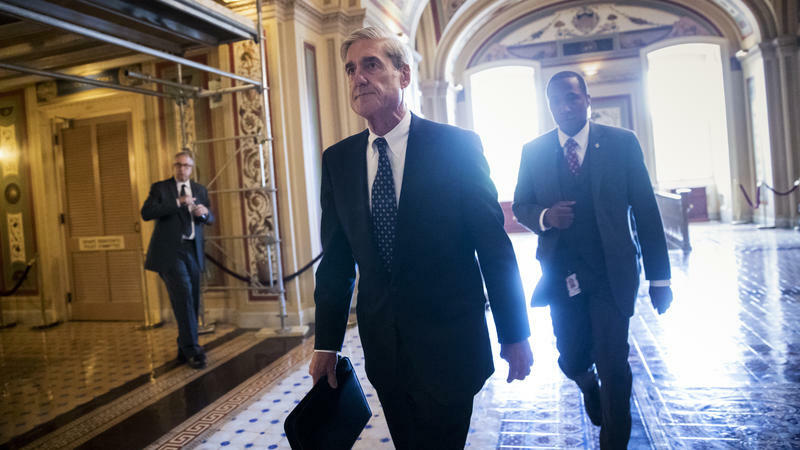 Trump's comments follow a report from The New York Times that he wanted to fire special counsel Robert Mueller, who is investigating Russian interference in the 2016 presidential election and possible ties to the Trump campaign. Asked about the report on Friday, Trump dismissed it as "fake news." President Trump is speaking at the World Economic Forum this morning in Davos, Switzerland. Aides say the president's speech is a pitch to do business in the United States, where Trump is working to foster a new climate of low taxes and limited regulations. The live stream does not go live until 8am ET. President Trump ordered White House counsel Don McGahn to fire Justice Department special counsel Robert Mueller last summer — but McGahn refused and threatened to quit himself if the president went ahead, according to an explosive report in The New York Times. Trump, in brief remarks as he entered the conference hall at the World Economic Forum in Davos, Switzerland, dismissed the story in what has become his characteristic fashion.